Social proof is a huge factor when it comes to influencing our decisions, especially people want us to part with money. For a lot of people, it’s the relevancy of the social proof that matters most. Is it from someone like them, or someone they already know and trust? Social proof can also depend on a number of other factors, such as how recent it was. If you want to do better . Implement a system of social proof that allows for you to regularly obtain examples of social proof. 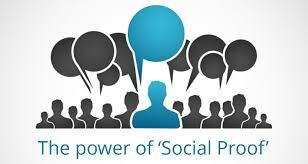 Of course, the best social proof occurs when you’re doing a great job so people want to recommend you!